When he couldn't get in, he decided to get off. He is accused of masturbating on a woman's front porch after he failed as a naked burglar, authorities said. 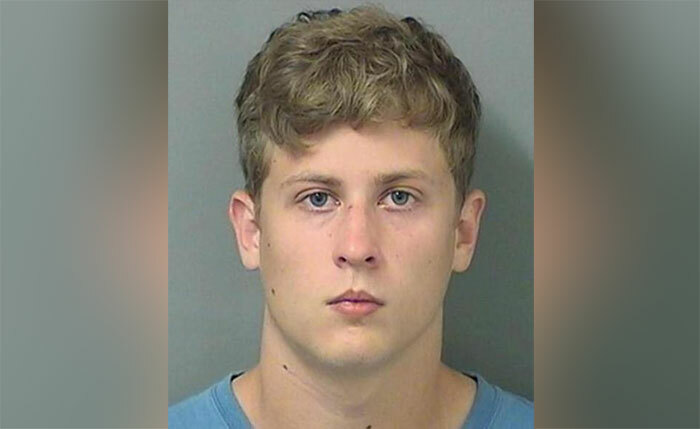 Blake Howard's explicit escapade was captured on surveillance video early Thursday morning, the South Florida Sun-Sentinel reported. The footage reportedly shows Howard at about 2 a.m. trying and failing to break in through the front door of the Boynton Beach house. He then wanders around back but is stymied by gate to the backyard pool. After stumbling through the bushes, he returns to the porch, sits on a bench and masturbates into a seat cushion, according to a police report reviewed by the Sun-Sentinel. He eventually leaves, taking the cushion with him. Police would later find it discarded in the back yard. The woman who lives in the home called police the next morning after noticing a pair of smashed-up lamp posts in her front yard and reviewing her security tapes. Howard and another woman returned to the scene of the crime later that morning, apparently to retrieve the battered car he'd left behind, authorities said. Cops confronted Howard about his late-night ramblings, but he wasn't the mood to reveal much. "I don't really want to get into it," he reportedly told them. He eventually admitted he'd been drinking and might have tried to skinny dip in his neighbor's pool, police said. He was booked into Palm Beach County Jail on charges of burglary and criminal mischief. Howard's lawyer, Richard Tendler, told the Sun-Sentinel the episode was a misunderstanding.